Powers/Abilities: Death's Head is a cyborg, superhumanly strong, able to detach limbs, and extremely difficult to do serious damage to. He carries a variety of weapons, many of which slot into the fitting where his left hand usually goes - he has employed axes, blades, machine guns, and a futuristic shotgun. He has in-built jets in his feet, allowing him to fly for short distances. He can control his body parts independent of the rest of him when they are detached - he has even done this when someone ripped his head off at the shoulders. History: Death's Head was built by Lupex, a technomage who survived for centuries by stealing one body after another, transferring his consciousness into victim after victim. He created the cyborg to gain a form that he would not have to leave so swiftly, but his treacherous wife, Pyra, awoke the cyborg's own mind, and it fled. Not recalling his origins, the cyborg established a business as a "freelance peacekeeping agent" (read Bounty Hunter), and dubbed himself Death's Head. One of his first recorded missions saw him in a reality where he took on gigantic proportions compared to the local humans, in order to combat his targets, the giant sentient robots known as the Transformers. Following a mission involving them, Death's Head collided with a TARDIS while traversing the space-time vortex. When he threatened the pilot of this craft, the Time Lord known as the Doctor, he was shrunk down to human size using a tissue compression eliminator, then thrown through time to Earth in the year A.D. 8162. There Death's Head battled, and was destroyed by, Dragon's Claws, a government troubleshooting team. He was rebuilt by Spratt, a young gang member with a flair for robotics, and together they set up a partnership (much to DH's chargrin), working on cases in this future time. 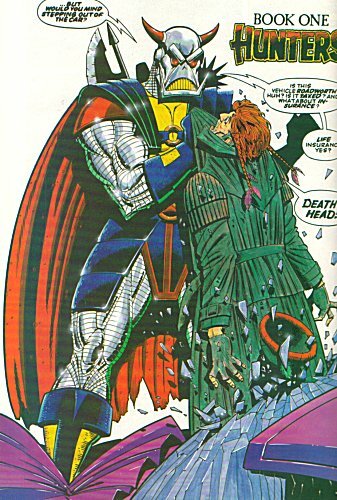 Hired by Josiah Dogbolter to kill the Doctor and retrieve the TARDIS, Death's Head discovered that he was being used as a patsy, and made his peace with the Time Lord, who dropped him off atop Four's Freedom Plaza in the Marvel Universe before he could change his mind. After a brief skirmish with the Fantastic Four, Death's Head was sent forward in time to A.D.2020. Unperturbed, he set up shop again, battling then working with the Iron Man of that era. However both Spratt and Big Shot, one of his foes in A.D. 8162, managed to follow him back too.Almost as soon as they arrived, both Lupex and Pyra tracked him down, the former seeking to reclaim his property. The end result of this encounter was that Death's Head learned his true origins, and killed his maker. 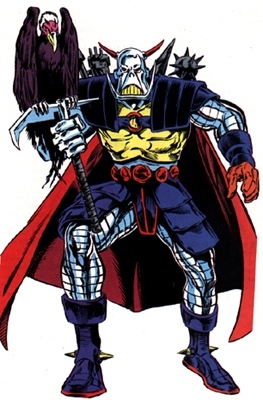 Only a little while later Death's Head faced the advanced Minion cyborg, created by Dr.Evelyn Necker for Advanced Idea Mechanics (AIM), a criminal organisation. Minion was gaining power and experience by tracking, killing, and absorbing the personalities and memories of a number of targets - Death's Head being the 105th such target. Death's Head put up a valiant fight...and lost. His body was wrecked, and his mind absorbed into the Minion cyborg. However this was not the end, for either component of his being - within the Minion form, Death's Head fought for control, and this time won. Though certain aspects of his personality were modified because of the instincts of the others that Minion had assimilated and the mind of the owner of the human body that was used to create the cyborg, Death's Head was reborn. As for his abandoned body, it was later taken over by the evil Charnel, who sadly slew Spratt. Comments: Thanks to Violet Shulman for additional info. Death's Head, the Minion cyborg who followed him.